Karaoke Party is Microgaming based online video slot game of 5 reels and 9 paylines. Coin sizes for this slot start from just 9pence and goes up to £45 per spin. You can win up to 8,000 times of your total stake, while playing this slot machine. There is a bonus round in this game known as free spin bonus feature which offers 15 to 30 free spins and up to 3x of multiplier. 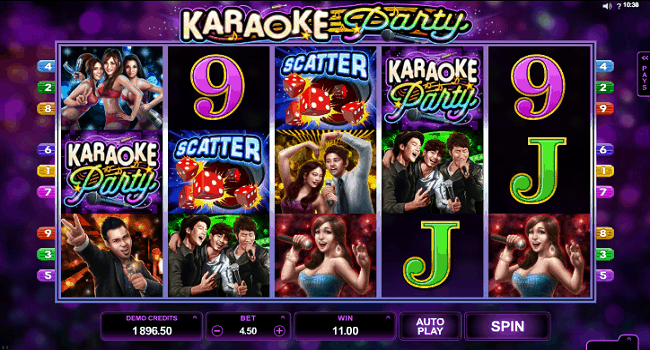 Karaoke Party is an outstanding slot from the makers of Microgaming. It is a very colorful and vibrant slot game which includes plenty of features and electronic characters on the reels. The ‘Karaoke Party symbol’ is the wild symbol of this game and it can replace all other symbols on your screen plus gives you a 2x of multiplier if you get a winning combination. If you land 3 scatters then you will receive 15 free spins plus 3x multiplier. Another 3 scatters will give you a total of 15 more free spins. It means you can have a chance of winning 30 free spin in this game. This is a medium range of game which can give you a top 3,333 times of your total stake. Play this slot at microgaming gaming casinos.